I hope everyone who has finished and filed all their federal and state taxes can come sing with us on Sunday, April 14th. Since I still need to finish, this will of necessity be brief. First, the Shiloh Singers will be singing in the Shiloh Meeting Hall located one block north of the Shiloh Museum's barn on Sunday, April 14th, from 1:30 until 4:00 P.M. Those who were able to attend the Missouri State Sacred Harp Convention can use the break and the "discussion groups" that gather before the singing at AQ's Chicken House just before noon and the after singing "My throat needs ice cream" session at the Springdale Denny's over by the Interstate. We have a good time catching up on all the news with some of our friends that we've grown to care about and whose friendship means so much to us. Second, the 4th Sunday West Fork Singing continues it's invitation to come sing in the West Fork's Library Meeting Hall. We've seen new faces and singers who live south of Fayetteville who find it easier to get to West Fork. Mix that with the dedicated Shiloh singers who want to extend our group and we have a good potential for growth. For those who are new singers, it's a excellent opportunity to practice and spend more time learning new songs from the red Denson book. The times are 1:30 until 3:30 P.M. on April 28th. Third, on Saturday, May 4th, the Shiloh Singers from Oklahoma to the Mississippi have the chance to sing together at the Northwest Arkansas Sacred Harp Singing Convention in Harrison, at St. John's Episcopal Church's Parish Hall. The singing will start at 9:30 A.M. and continue until 3:00 P.M. with a pot luck lunch at noon. The PDF copy of the flyer (suitable for printing for your friends and potential singers) is attached. Just click on the blue link below to download the flyer with more details and directions. 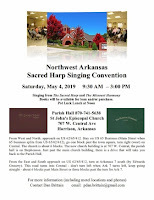 There are even more singings in May with singings in Old Washington, AR in the historic Old Washington Methodist Church on Saturday, May 18th and the Old Folks Singing in Tull, AR, on Sunday, May 19th. The two venues are close enough that it's easy to attend two good old-fashioned Arkansas singings on the same weekend. More details to follow. We will not have a regular singing on Sunday, March 10th. Many of our group are happily singing in Missouri so we won't be singing in Springdale. However, we will have a 4th Sunday Singing in West Fork on Sunday, March 24th. For other upcoming singings, please see the previous (Feb 12th) blog entry. The Shiloh Singers enjoyed having 22 singers at the February Singing on February 10th in the Shiloh Meeting Hall. There was a fine contingent of young people who jumped right in and joined our singing with just a short introduction from Dan Brittain and other experienced singers. We always enjoy having visitors and we were certainly glad to have the students with us and hope they'll bring a few more students with them next time, which will be on April 14th from 1:30 P.M until 4:00 P.M. Early arrivals are always invited to join the Sacred Harp lunch group at the AQ Chicken House in Springdale at noon. Just ask where the singers are at the reception desk. The 34th Missouri Sacred Harp Singing Convention is on the schedule for March 9 and 10 in St. John's United Church of Christ located in Pinckney Township, MO. The two day singing and dinner on the grounds (actually in a kitchen and dining hall) sets a high standard for singers to attend and start off the new year. Singers converge on the Missouri Convention from all four directions and it's usually a good idea to make reservations early. Click on the following link for a PDF copy of the flyer with information about the singing, lodging and directions to the church. If you'd like to car-pool to save on trip expenses, send an email using this email link: B. R. Black and include your phone number and we'll see if we can find an available seat. Starting a 4th Sunday Sacred Harp Singing in West Fork: Thanks to Ray and Karen Towne, who have been laying the groundwork to start another opportunity for the Shiloh Sacred Harp Singers to spread the word about shape note singing in the southern part of Washington County. The present plan is to sing in the West Fork Library Hall at 210 Garfield Ave. from 1:30 until 3:30 P.M on February 24th and each 4th Sunday thereafter if there are sufficient singers both to help lead and and local singers from the surrounding area who want to learn about singing on the frontier before most churches could afford pianos and organs. If you live in south Washington County or North Crawford County, or anywhere within driving distance, please mark your calendar and join us on February 24th. From I-49 take the "West Fork" exit (Hwys. 156 and 170). Turn eastbound onto Phillips Street and after you pass the Harps you'll follow the curve to the south onto McKnight Ave. Continue to the stop sign at Main Street and turn left. This takes you eastbound again, across the railroad tracks and you'll come to Garfield Ave.. Turn left and you may park on the street, at the Library or in the grass lot just south of Library Hall. From Hwy 71 turn westbound at the only flashing yellow light in town. This is Main St. When you get to Garfield Avenue you'll see the new Library on the north side of the street. Turn right on Garfield Ave. and Library Hall is on the right at the next corner, #210 Garfield. Dress is informal, and all who want to learn are invited to sing, listen or just tap their feet. We hope you'll join us. Just to be fair, we may pass a hat for a dollar or two to help the Friends of the Library cover any cost of heating, lights and other minor expenses. We're a "non-profit" too. We'll post any changes or updates on this webpage so please check this webpage for any updates.